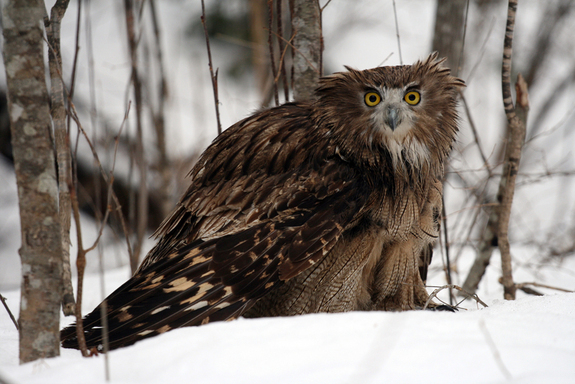 The Blakiston’s fish owl (Bubo blakistoni) is an intimidating creature of tufted ears and daunting size – the largest known owl in existence, it stands at up to 75 cm (2.5 feet) and has a wingspan of over 180 cm (6 feet). It is also a flying barometer of forest health. Its dining habits – it feeds on salmon and other fish from running rivers – require pristine forest and river health. A study has shown that the large trees in which the fish owl nests are the very ones that create the best river environments for salmon life cycles, and thus add another facet to why these trees are important to the fish owl. When the trees age and fall into rivers, their girth and length creates the deep backwaters and rapid-flow passages the salmon require. 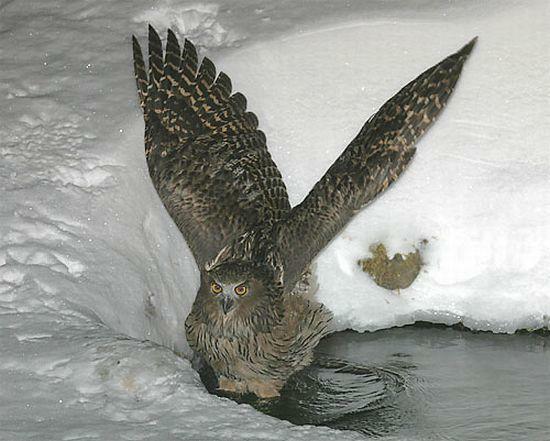 If the Blakiston’s fish owl is disappearing from its ranges in the Russian and Chinese far east, and in northern Japan, it is mostly due to habitat disruption. Other factors are the big bird’s inability to avoid getting caught in power lines and fish nets. The fish owl is an impressive if shy indicator of the well-being of the forest, an element in an equation that includes salmon, other owl species and large mammals. At the heart of the equation are the old-growth trees. And what is the solution to this equation? Reduced logging, recovery programs for river systems, restricted human access to remote protected areas. Elements we often have difficulty adding up to action, but that doesn’t mean it’s not worth trying.